“NEXUS is widely recognized as one of the most influential percussion ensembles to have emerged in the post-war period” (2006 doctoral dissertation U of Hong Kong.) New York Times has called NEXUS “the high priests of the percussion world” and Steve Reich says, “probably the most acclaimed percussion group on earth.” NEXUS is in the Percussion Hall of Fame (along with Ringo Starr) and tours extensively. The group has participated in 60 international festivals, 4 times at the Kennedy Center, twice at the BBC Proms (Royal Albert Hall), 5 times in Carnegie Hall. 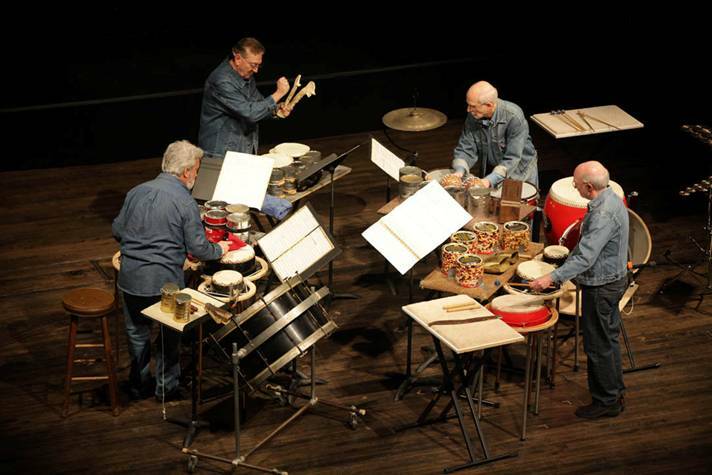 The group is made up of four master percussionists internationally revered for virtuosity, innovation and extraordinary music out of the broadest array of percussion instruments imaginable. Their original compositions and arrangements, high-end commissions from Pulitzer prize-winners Steve Reich and Ellen Taafe Zwillich, Grammy-winner Libby Larsen, and Japanese master Toru Takemitsu, and famed collaborations with the likes of Canadian Brass, Kronos Quartet, and Richard Stoltzman, have created repertoire ranging from novelty ragtime and haunting African rhythms through award-winning improvised film music and ground-breaking compositions. NEXUS delivers a stunningly virtuosic spectacle of sound and rhythm. NEXUS wishes to acknowledge the generous support of Pearl/Adams and the Canada Council for the Arts. The first, entirely improvised NEXUS concert in 1971 formed a group that touches and entertains people worldwide. Bob Becker, Bill Cahn, Russell Hartenberger and Garry Kvistad are virtuosos alone and bring their knowledge and character to a distinct and powerful whole. NEXUS stands out in the contemporary music scene for innovation, program diversity, an impressive history of collaborations and commissions, their revival of 1920′s novelty ragtime xylophone music, and influential improvisatory ideas. NEXUS’ commitment to music education and a steady output of recordings and new compositions continue to enhance percussion’s role in the 21st century. NEXUS’ widespread appeal has taken the group to Australia, New Zealand, Asia, Brazil, Scandinavia, Europe, and regularly to the USA and Canada. NEXUS was the first Western percussion group to perform in the People’s Republic of China, and have participated at international music festivals such as the Adelaide, Holland, Budapest Spring, Singapore Arts, Tanglewood, Ravinia, and Blossom Music, the BBC Proms in London, Tokyo’s Music Today and Music Joy festivals, and many World Drum Festivals. NEXUS has received the Banff Centre’s National and the Toronto Arts Awards. NEXUS was inducted into the Percussive Arts Society Hall of Fame in 1999 in their 30th anniversary season. In 2017 NEXUS members Russell Hartenberger and Bob Becker were honoured with the Leonardo da Vinci World Award of Arts and Musical America’s “Mover & Shaper” award, respectively. The World Cultural Council’s citation says, “Hartenberger is considered a musical visionary and one of the most prominent figures in percussion history”, while Musical America named Becker one of “the Top-30 Professionals in Music” and said, “As a composer, arranger, and founding member of the NEXUS percussion ensemble, Bob Becker has influenced virtually every aspect of percussion performance and repertoire in the profession.” The past few years have taken NEXUS to performances with Steve Reich in Toronto and New York; residencies in the Carolinas and the Curtis Institute of Music; a concert performance with the Philadelphia Orchestra’s percussion section; the launch of Maverick Hall’s 100th Anniversary concert series; appearances with the acclaimed Eastman Wind Ensemble, Rochester Philharmonic and Toronto Children’s Chorus; concerts in Houston, Rockport MA, Open Ears Festival, Drum Boogie Festival with Jack DeJohnette, Ottawa ChamberFest, and with 7-time Grammy-winner Paul Winter and the throat-singers of Prana, resulting in the album Chiaroscuro. Recent new commissions have come from Peter Schickele, Libby Larsen, Michael Burritt, Eric Ewazen, Gordon Stout, and Canada’s Norbert Palej, as well as the co-commissioning of Steve Reich for his Mallet Quartet. 2011 and ‘12 brought sell-outs in Japan, a featured appearance on the Canadian Brass’s best-selling CD Stars and Stripes – A Tribute to the USA and in concert appearances, and John Cage’s 100th Anniversary at the Fisher Center. 2018 will take NEXUS into Northeastern United States and Canada. Especially renowned for improvisational skill, NEXUS created the music for the National Film Board’s award-winning Inside Time, and the chilling score for the Academy Award-winning feature-length documentary The Man Who Skied Down Everest. NEXUS’ high-profile collaborations include the Kronos Quartet and clarinetist Richard Stoltzman. Toru Takemitsu, a great friend to NEXUS, composed their signature piece From me flows what you call Time…written with each member’s personality in mind. It was premiered for Carnegie Hall’s 1990 centennial conducted by Seiji Ozawa with the Boston Symphony (recorded on Sony with the Pacific Symphony). In 2005, Pulitzer Prize winning composer Ellen Taaffe Zwilich composed Rituals for NEXUS and chamber orchestra. New Music Box calls it “one of Zwilich’s most exciting compositions to date…[a] blockbuster piece!” The recording features NEXUS and the IRIS Orchestra. NEXUS’ newest recording Home celebrates ecological sustainability. Their recent album The City Wears A Slouch Hat rediscovers once-lost works by John Cage that NEXUS was asked to resurrect and premiere for The John Cage Trust. Their album Persian Songs features beloved Iranian vocalist and setar performer Sepideh Raissadat, following on NEXUS solo CD Wings (2009) and Juno-nominated Drumtalker. Ms. Raissadat was the first female vocalist to perform in public in Iran after the 1979 revolution. Her virtuosic performances of traditional Persian music have been praised through Europe and North America. NEXUS has joined her for an hour-long Voice of America broadcast and performances in Toronto, Kitchener, Ottawa, New York State, and San Antonio TX. NEXUS wishes to thank Pearl/Adams and The Canada Council for the Arts for their ongoing support. Bob Becker’s performing experience spans nearly all of the musical disciplines where percussion is found. He has been percussionist for the Marlboro Music Festival and timpanist with the Marlboro Festival Orchestra under Pablo Casals. For several years he toured as drummer and percussionist with the Paul Winter Consort. He has also performed and recorded with such diverse groups as the Ensemble Intercontemporaine under Pierre Boulez, the Ensemble Modern of Germany, the Schoenberg Ensemble of Amsterdam and the Boston Chamber Players. He has appeared as tabla soloist in India and has accompanied many of the major artists of Hindustani music. He is also a founding member of the Flaming Dono West African Dance and Drum Ensemble in Toronto. As a regular member of the Grammy Award-winning ensemble Steve Reich and Musicians, he has appeared as soloist with the Israel Philharmonic, the Brooklyn Philharmonic, the New York Philharmonic and the London Symphony and recorded for Deutsche Grammophone, EMI and Nonesuch. Generally considered to be one of the world’s premier virtuoso performers on the xylophone and marimba, he also appears regularly as an independent soloist and clinician. In particular, his work toward resurrecting the repertoire and performance styles of early 20th century xylophone music has been recognized internationally. Becker has performed and lectured for music departments and percussion programs throughout North America and Europe. His clinics and workshops cover a wide variety of percussion topics including North Indian tabla drumming, West and East African percussion, “melodic” snare drumming, rudimental arithmetic, and ragtime xylophone improvisation concepts. Becker’s compositions and arrangements are performed regularly by percussion groups world-wide. In the spring of 1997 he was selected to be composer-in-residence for the Virginia Waterfront International Festival of the Arts, which presented the US premier of his orchestral work Music On The Moon, with JoAnn Faletta conducting. His most recent works are settings of poetry by the American author Conrad Aiken, featuring voices and strings as well as keyboard percussion. His most recent composition, Preludes, was commissioned in 2011 by the Banff Centre for the Arts, and was premiered at the Roots and Rhizomes Percussion Residency with Steven Schick conducting. Bob Becker has been associated with the Malletech company since 1988, and plays the Malletech ragtime/soloist xylophone, which he helped design. He uses the Bob Becker signature line of Malletech mallets. He is also an endorser and designer for the Sabian cymbal company, and was honored with Sabian’s Lifetime Achievement Award in 2005. In 2006 he was recognized as a “Master Drummer” by the International Association of Traditional Drummers, an organization founded by the legendary rudimentalist John S. Pratt. Bill Cahn has been a member of the NEXUS percussion group since 1971 performing with symphony orchestras and in solo concerts worldwide. From 2005 to 2015 he was Associate Professor of Percussion at the Eastman School of Music and a visiting artist in residence at the Showa Academy of Music in Kawasaki, Japan. Bill was the principal percussionist in the Rochester Philharmonic Orchestra from 1968 to 1995, and he is a life member of the orchestra’s Honorary Board of Directors. Bill has performed with conductors, composers, ensembles, and artists representing many musical styles, including Chet Atkins, John Cage, Aaron Copland, Sir Andrew Davis, Chuck Mangione, Mitch Miller, Seiji Ozawa, Doc Severensen, Leopold Stokowski, Igor Stravinsky, Edgar Varese, and Paul Winter. His book, “Creative Music Making” (2005), on freeform improvisation is published by Routledge Books. Bill’s workshops and residencies include community hand drumming, improvisation, careers in music, and the business of music. Bill has received the Rochester Philharmonic League’s FANFARE AWARD (1988) for a “significant contribution to music education in Rochester,” Mu Phi Epsilon’s MUSICIAN OF THE YEAR AWARD (1993), and with NEXUS, the TORONTO ARTS AWARD in music (1989), the BANFF CENTRE FOR THE ARTS NATIONAL AWARD (1997), and induction into the Percussive Arts Society’s HALL OF FAME (1999). In 2005 he received the SABIAN LIFETIME ACHIEVEMENT AWARD, and in 2015 the Arts and Cultural Council of Greater Rochester LIFETIME ACHIEVEMENT AWARD. In 2006 Bill received a GRAMMY Award with the Paul Winter Consort. Russell Hartenberger is Professor Emeritus and former Dean of the Faculty of Music, University of Toronto. He has been a member of both the percussion group Nexus and Steve Reich & Musicians since 1971. He began his percussion studies in Oklahoma City with Alan Abel. In 1966 he received his B. Mus degree from Curtis Institute where he studied with Fred D. Hinger. Upon graduation from Curtis, he joined the U. S. Air Force Band and toured throughout the U.S., Europe, and South America as timpanist and xylophone soloist. While in the Air Force Band, Russell received his M. Mus. degree from Catholic University where he again studied with Alan Abel. He holds a Ph.D. in World Music from Wesleyan University, specializing in the music of West Africa, North and South India, and Indonesia. Russell has been a member of the Oklahoma City Symphony, percussionist at the Marlboro Music Festival, principal percussionist of the New Haven Symphony, timpanist with the Canadian Opera Company, and performs often with the Toronto Symphony. He has performed with the Paul Winter Consort, Ensemble Modern of Germany, World Drums, and New Music Concerts of Toronto. He also has worked and/or recorded with such diverse musicians as Abraham Adzenyah, Robert Aitken, Leo Brouwer, Pierre Boulez, John Cage, Canadian Brass, Pablo Casals, Peter Erskine, Gil Evans, Steve Gadd, Jimmy Garrison, Vinko Globokar, Barbara Hannigan, Fritz Hauser, Paul Hillier, Heinz Holliger, Paul Horn, Mauricio Kagel, Kronos, Yo Yo Ma, Phil Nimmons, Pauline Oliveros, Oscar Peterson, Sepideh Raissadat, Samulnori, Trichy Sankaran, Peter Schickele, Peter Serkin, Boogsie Sharpe, Richard Stoltzman, Glen Velez, Paul Winter, and Paul Zukofsky. With Steve Reich and Musicians he recorded for ECM, DGG and Nonesuch Records, and performed on the Grammy Award winning recording of Music for 18 Musicians. With the Reich Ensemble, Russell toured throughout the world and performed with the New York Philharmonic, Israel Philharmonic, Cologne Radio Orchestra, London Symphony and Brooklyn Philharmonic. As a member of Nexus, Russell has performed with leading orchestras in North America, Europe and Asia. Along with members of Nexus, he created the sound track for the Academy Award-winning Full-Length Documentary, The Man Who Skied Down Everest. His awards include the Toronto Arts Award in 1989, Banff Centre for the Arts National Award in 1997, a Juno nomination in 2005, and was inducted into the Percussive Arts Society Hall of Fame in 1999. He was presented with the Leonardo da Vinci World Award of Arts by the World Cultural Council at Leiden University, the Netherlands in November of 2017. The Nexus CD, Persian Songs, includes his arrangements of music by Moondog and of Persian classical music with Iranian vocalist, Sepideh Raissadat. His composition, The Invisible Proverb is on the Juno-nominated CD, Drumtalker. His other compositions include Telisi Odyssey, Cadence, Raghavan, and Birth of Time. His article, “Encounters with John Cage,” appeared in the Sept. 2012 issue of Percussive Notes and his essay, “Clapping Music: A Performer’s Perspective,” is in The Ashgate Research Companion to Minimalist and Postminimalist Music (Ashgate 2013). He is editor of The Cambridge Companion to Percussion and author of Performance Practice in the Music of Steve Reich, both published by Cambridge University Press in 2016. Garry Kvistad has been a member of NEXUS since 2002 and has toured and recorded with the ensemble Steve Reich and Musicians since 1980. Garry is one of 18 musicians to win a Grammy award for the 1998 recording of Steve Reichs Music for 18 Musicians. Garry attended the Interlochen Arts Academy and earned his BM from the Oberlin Conservatory of Music. He received an MM from Northern Illinois University where, in 1993, he was honored with its Distinguished Alumni Award. In the 1970s, Garry worked with composer/conductor Lucas Foss as a Creative Associate in Buffalo, New York, after which he joined the faculties of Northern Illinois University and the University Of Cincinnati College Conservatory Of Music with the Blackearth Percussion Group. Kvistad has served as the timpanist and percussionist with the Chicago Grant Park Symphony, was a summer Tanglewood Fellow, and a percussionist with the Cabrillo Music Festival Orchestra, California. The Balinese Gong Kebyar Gamelan ensemble, Giri Mekar, which he formed in 1987, is currently in residence at Bard College where Garry serves on the Faculty of the Conservatory of Music. Garry served as Chairman of the Board of Directors of The Woodstock Byrdcliffe Guild, Woodstock, NY (board member for 20 years) where a building was named in his honor in 2008. Garry is the founder and CEO of Woodstock Percussion, Inc., makers and distributors of Woodstock Chimes and musical instruments for children sold worldwide. In 2010, Garry was presented with the inaugural ICON Honors Achievement Award from the Atlanta Gift Mart. Garry is on the advisory board of the Phoenicia Festival of the Voice and the creator/Executive Director of the Drum Boogie Festival which was held in 2009 and 2011.